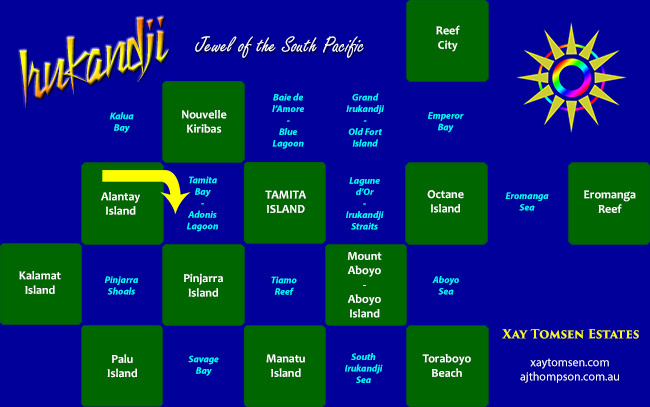 Adonis Lagoon is a simulator on the InWorldz virtual world, located in Tamita State in the Kingdom of Irukandji. Previously named Tamita Bay, the change of name to Adonis Lagoon happened as a result of trying to differentiate its name from the neighbouring capital, Tamita Island. Given the high number of gay and lesbian residents on the estate, I also took the chance to 'gay up' the bay to fill a need for a gay-friendly facility on the grid. At the same time, I built a more universal 'straight-themed' venue on the diagonally-adjoining sim, Baie de l'Amore, which also gained a new name, Blue Lagoon. During the life of the earlier Tamita Bay, the name Adonis Lagoon was already in use but only as a subdivision of the bay. 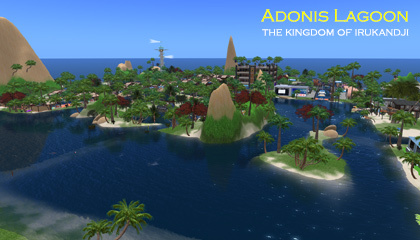 After the name change, Adonis Lagoon was re-terraformed to fill in the central lagoon area and make it a flat parkland. The layout of Adonis Lagoon was that of a central low island surrounded by sea. A low range rose in the south of the island providing a privacy screen from Pinjarra Island, and built into the side of the hill were old temple ruins reclaimed by nature. Inside the ruins, two springs trickled down into a marble-and-gold lined pool, with platforms around the side with various animations for visitors to enjoy. On the eastern shore of Adonis Lagoon, knee-deep shallows surrounded by rocks, formed a lagoon, before rising slightly to connect with the beach and grassy lawns of the palace on Tamita Island. The effect was very regal and elegant, and the overall concept well received with many visitors frequenting the lagoon and its relaxation areas. On a functional level, Adonis Lagoon was an important transport terminus for the kingdom. The Inter Island Causeway entered from Tamita Island in the east then traced the outer northern perimeter of the island before continuing on to Alantay Island as a submerged causeway in the west. A fork of the underwater road also deviated north into Nouvelle Kiribas. A branch of the Aboyo River terminated in Adonis Lagoon, entering from Pinjarra Island in the south, while the Maskari River flowed in from Nouvelle Kiribas in the north before entering Alantay Island. The Adonis Lagoon rebuild was a worthwhile endeavour, and solved both of the issues that brought about its creation. If I ever reinvent this section of Irukandji on a future grid, I imagine that this sim will again be called Adonis Lagoon instead of the traditional Tamita Bay. Other regions that adjoined Adonis Lagoon but did not gain a mention already, were Tiamo Reef, Pinjarra Shoals, and Kalua Bay. Below you will find a few more photos of Adonis Lagoon. To explore more of the Irukandji continent, visit the main Islands of Irukandji page.